It’s late July. We still have plenty of summer left to enjoy. Most people are not ready to think about fall just yet. Yet if you are a homeowner with a lawn, now is a good time to think about what needs to be done to you our lawn once the leaves turn and a chill seeps into the air. Think of this as a pre-fall planning guide for your lawn. If you also have a garden, this is the month to begin those fall garden preps. Some plants that were planted in the early part of spring may need some attention. If you need to harvest plants, the best time to do so is early in the morning. Any produce that’s been basking in the summer heat should be soaked in cool water. Back to your lawn. Fall is a great time for a feeding. Fertilizing in the fall is great for turf grasses. A slow release, natural fertilizer will be perfect for delivering much-needed nutrients to the lawn. And don’t forget the watering. Your lawn will need water after the fertilizer. This is where a lawn sprinkler system comes in handy. It’s also important to keep mowing in the fall. Mow the lawn with the blades at the same height as they've been throughout the summer. In the late fall, adjust the mower blades to their lowest settings. This will allow sunlight to reach the base of the grass before winter. 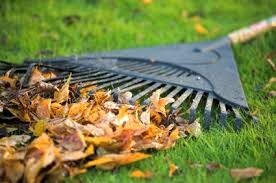 Rake the leaves or mow them with a mulching lawn mower. Wet leaves that accumulate on the ground can be a breeding ground for fungal diseases. This is why it is so important to remove the leaves while they are still dry and easy to rake or mow. Remember not to water at night, especially in the fall. The nights are cold and the water will take much longer to reach the roots in the soil.